The paralysis tick is a eight-legged insect that produces a potentially deadly toxin for cats and dogs. It is found in the coastal areas of NSW, and certain parts of Sydney i.e. the beaches, the mountains, Dural and Kenthurst. They can be carried by wildlife such as bandicoots. The best prevention is checking your pet daily by running your fingers throughout the coat, feeling for and investigating any lumps or bumps. The pictures above outline the appearance of the tick. Veterinary products enhance protection against ticks. These include Bravecto (a chew that lasts for 3 months), tick collars like Seresto & Scalibor, and spot-ons such as Frontline or Advantix every two weeks. severe breathing problems, collapse and death. If you see the clinical signs above, search for a tick(s). If you find one, you can remove it with a tick hook or grasp it near the skin and remove it in a corkscrew action. 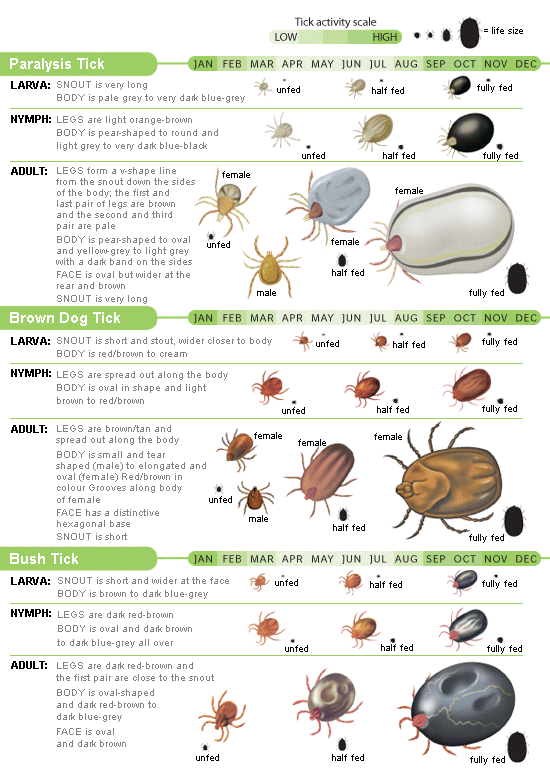 Take your dog or cat to the vet and keep the tick so it can be identified. If you find it is too difficult to remove the tick, the tick's head is left in the skin, or you can't find the tick but strongly suspect there is one attached to your pet, don't worry, the veterinary staff will help when you arrive. How is tick paralysis treated? The animal has a complete search to ensure no further ticks. Sometimes a total coat clip is necessary to facilitate a proper search. The anti-toxin serum is given intravenously over 30 minutes. The throat is frequently cleansed of excess saliva. The chest is protected with diuretics or antibiotics depending on the complications. Intravenous fluids are given to maintain hydration. A very important requirement for the month after recovery is complete rest. Please call 9626 9561 if have your pet is suffering from tick paralysis or you wish to find the optimal tick prevention for your pet.